Trash is a dirty business, clearly, but also a highly profitable one. Humans have a tendency to create a lot of waste, more than we should, and it has to be taken care of. This taking care of the parts we like to conveniently forget about has made some companies and some people very rich, yet, for some reason, here in the US we are mostly still confronted by the extremely noise, extremely dirty, extremely scary and mostly still very dirty trash trucks. 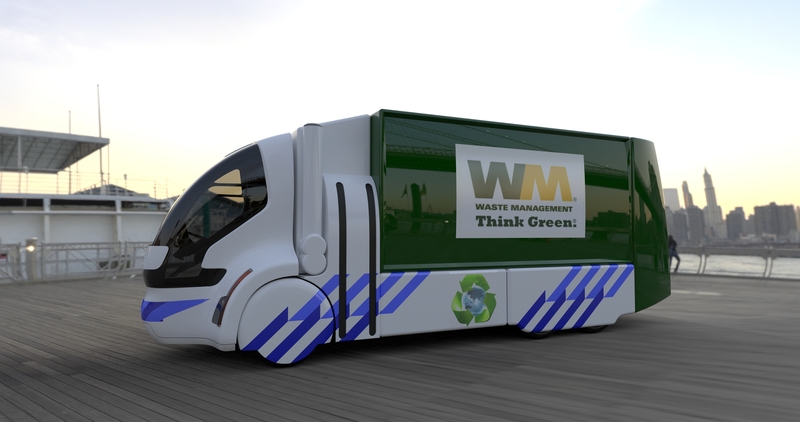 Cornelis Steenstra from Foresee Car Design together with George Gaffoglio from Metalcrafters, Inc. have used their recent experiences with zero emission vehicles to come up with a concept that would tackle all of these issues, and came up with the IntelliTruck concept design.Most current garbage trucks in the US market seem to not have developed their cab design and construction since the early 70’s, still featuring simple flat panels crudely bent at the edges, riveted together like they have been since the 1930’s. The glass panels are flat, since flat is cheap of course, and although some do run of ‘clean’ natural gas, from the fumes they produce you couldn’t tell. 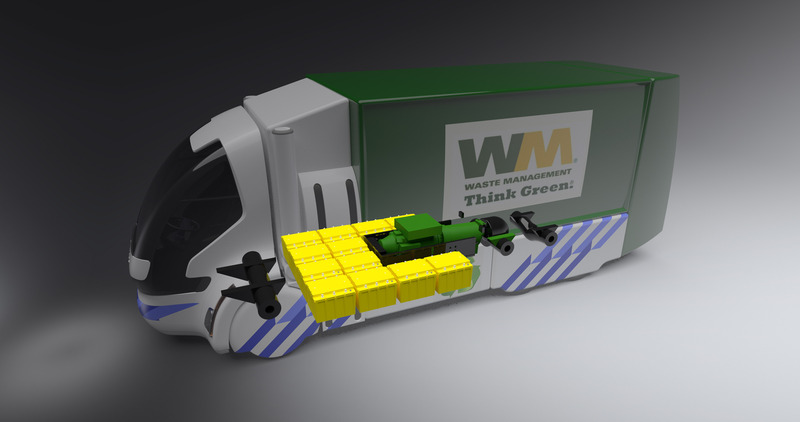 From a practical point of view most trash can be placed on either side of the street, also on the more narrow one-way streets, so to avoid the extra time and expense of driving through those areas twice, the cabins feature double steering positions on left and right side of the truck. Most of the time the trucks are operate by a single person, with various contraptions to be able to grab the personal and corporate containers and empty them inside the trash area without the operator needing to leave his cab. The trash trucks mostly operate within the busy urban areas, and have a limited drive out to rid themselves of their loads, so the average range for these trucks is also quite limited per load. Based on the technology George Gaffoglio had developed, Cor Steenstra came up with a design which featured a more narrow cab with a central driving position. This would allow the driver/operator to precisely oversee operations on either side of his vehicle. 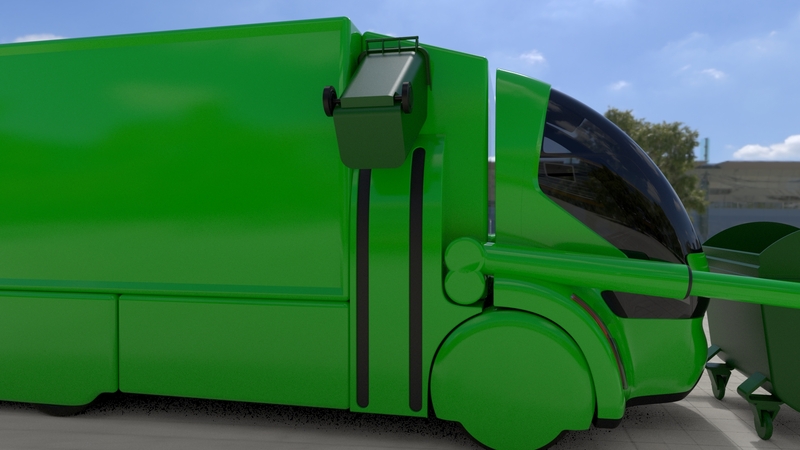 The narrow cab also will allow for more easy maneuvering around tight corners and in congested urban areas by reducing the space the vehicle needs to corner. The large round glass surface combined with the front lift construction allows the operator clear visibility while taking care of the larger business containers. On both sides of the vehicles are retractable clamp arms which slide up a rail to take care of the smaller home containers. The batteries are housed behind the front axle to offer a central center of gravity for a more stable operation, and drive the powerful centrally mounted electric power train. An option for 4 and even 6 in-wheel motors is also available. Both front and rear wheels are fully covered to enhance the impression of cleanliness and friendliness with which this vehicle can quietly operate within highly populated areas.